Audioslave frontman Chris Cornell is to write and record the theme tune to the new James Bond film, Casino Royale. The theme for the 21st Bond film, in which Daniel Craig will debut as 007, is titled You Know My Name. A film spokeswoman said Cornell's music was "both soulful and tough" and "the perfect complement" to the film. Casino Royale will receive its world premiere in London on 14 November. The film is released three days later in the UK and US. 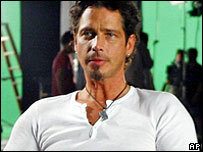 US rocker Cornell was previously the singer with Seattle rock group Soundgarden. He joins a long list of famous names who have recorded songs for Bond films, including Madonna, Sir Paul McCartney, Duran Duran, Shirley Bassey, Tina Turner and Nancy Sinatra. Many of the songs from the early Bond movies have become classics, such as Bassey's Goldfinger and Sinatra's You Only Live Twice. But recent efforts like Tina Turner's Goldeneye and Sheryl Crow's Tomorrow Never Dies have proved less enduringly popular. Casino Royale is based on the first of Ian Fleming's celebrated spy novels. All funds from the Royal Film Performance will go to the Cinema and Television Benevolent Fund (CTBF). The first Royal Film Performance took place in 1946 and has been held every year since, apart from 1958. The first film chosen was A Matter of Life and Death, starring David Niven. How long can James Bond last?